Here in the Northeast, it’s been a mild winter so far — if you exclude the freak Halloween storm that caught us all by surprise. But the roads are slick today so you may need a refresher in winter driving and car care. The Massachusetts Department of Transportation offers a great page of safe winter driving tips – including everything from preparing your vehicle, supplies you should have in the car, safe driving pointers, and advice for what to do if you are stranded while driving. One of the things that always seems difficult is sharing the road with plows and snow clearing equipment – to pass or not to pass? 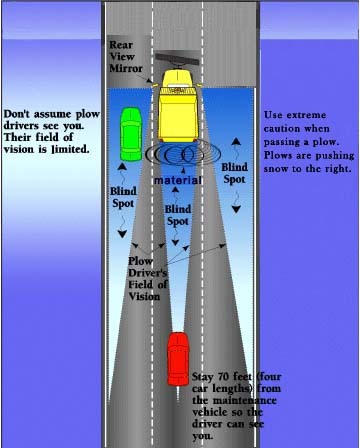 So the common sense tips for driving near plows offers some good guidance. The graphic that accompanies the tips is excellent so we are reprinting it below.